Miss Imperial (17 Oct 06 - 10 Sep 07): "And now your friends, they're filling up my car." "And now your friends, they're filling up my car." 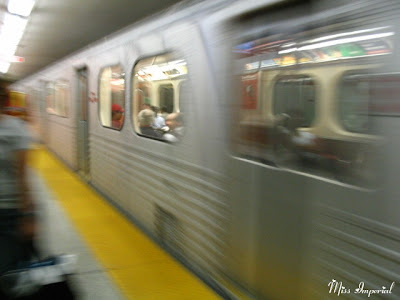 right on the subway train." A clearly intoxicated young man weaving up and down the aisle of the car. I am sitting near a hefty, mannish woman, who may actually be a man, or may have once been a man. Occasionally I feel as if she is staring at me and when I look up and over at her, I see that she is in fact staring at me. Or maybe she's staring past me, out the window, at darkened tunnel walls. Not much to see either way. She's nestled behind a giant black portfolio. The young man is stopping in front of people in a random pattern, asking each of them if any of them can spare some change for food. Sometimes he crouches down and bends his head, looking right at the person's face. No one is paying attention to him; everyone is avoiding eye contact, not just with him, but with each other as well. "None of you can spare any change?" the young man hollers. "I can't BELIEVE none of you have any change!" "Here, here," a young woman mumbles, holding out a palmful of coins. He nods and scoops them up. "Heyyy," he drawls, leering at her, "I think I know you from somewhere." He turns and addresses the entire car. "I KNOW ALL OF YOU FROM ALL OVER! You know me, too! Old Mill! High Park! Right? Yeah, I thought so." The train pulls up at Queen's Park and the woman sitting near me stands up. Portfolio in hand, she moves a folded-up newspaper with the sole of her foot, dragging it from under her seat and around the base of a partition, bringing it to the exit. She kicks the paper onto the platform, then follows it, picking it up as the car doors close. The young man is still shouting. "I'm two dollars short of a case of beer!" He shakes his head and moves toward the exit. "No one has any money!" He mutters something about the state of the people on the car, who seem relieved to see the young man go. "I'm going to see what it's like on the other side," he tells us as the train pulls into the next station. "I'm going to get lucky on the other side! No one has any money! Here. No one has it. I'm two dollars short for beer!" He shakes his head again as the doors open. "I'm two dollars short!" he screams, then runs alongside the train, disappearing down the platform. TRACK LISTING: New York Dolls, "Subway Train"